Each month the Whole Grains Council features a different whole grain on its website. For December it’s buckwheat. I love the word buckwheat. I love its sound. I love its healthful connotations. So one day I set out to make buckwheat pancakes. I like to make pancakes. I like the word buckwheat. I assumed I would like buckwheat pancakes. I assumed wrong. I felt betrayed. My tongue was shocked, as though someone had slipped jalapeno into a creamy fruit shake. According to the Grains Council, buckwheat is a pseudo-cereal that has been around for more than 8,000 years but it is neither wheat, nor something bucks like to eat. The name started because its seeds resemble the beech tree, so “beech wheat” became buckwheat. Like other whole grains, buckwheat is full of health benefits including a high protein content, great minerals and lots of fiber. It has been found useful for treating hypertension, obesity, constipation and more (just like other whole grains). Buckwheat is a short-season crop, and “performs well in acidic and under-fertilized soil.” It can also keep weeds and soil erosion to a minimum. So not only is it good for you, but it’s good for the environment. The good news for people who like buckwheat and need to maintain a gluten-free diet, is buckwheat is gluten free. The good news for me, is while I don’t like buckwheat pancakes, I do appreciate the grain in other forms, made into other foods, such as soba noodles. 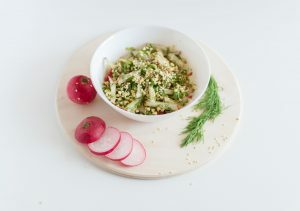 Please make a comment below and tell us about your favorite way to eat buckwheat.